FARGO, N.D. (AP) -- North Dakota residents say they've had enough of a decades-old controversy on its flagship university's nickname. Voters overwhelmingly decided Tuesday to dump the University of North Dakota's Fighting Sioux moniker, an issue that has put its athletic teams at risk for NCAA sanctions and divided sports fans, alumni and even tribes. But even for the winners, the outcome was bittersweet. "This is a political matter with no celebration," said Tim O'Keefe, executive vice president and CEO of the UND Alumni Association and Foundation and the man who led a campaign to retire the nickname. "We've said all along that this is not an issue about preference. Clearly if that were the case, the name would be staying. The price of keeping the name is simply too high." Some American Indians from the state's two namesake tribes lobbied for the name and logo to be kept, arguing that they reflected a positive image for their tribes. Eunice Davidson, an enrolled member of the Spirit Lake tribe and member of the committee to save the nickname, was too devastated to talk about the result, her husband Dave Davidson said. "I will be honest with you. I'm heartbroken and I'm ashamed of this state," Dave Davidson said. "On the other hand, there are a lot of wonderful people we have met in the course of this." Voters in Tuesday's North Dakota primary were asked whether to uphold or reject the Legislature's repeal of a state law requiring the school to use the nickname. The vote sends the matter back to the state's Board of Higher Education, which is expected to re-retire the nickname and American Indian head logo that seven years ago was deemed hostile and abusive by the NCAA. The final tally showed about 68 percent in favor of retiring the nickname, but the divide was still evident at the voting booths. Only one county voted to save the nickname. Billings County, in far western North Dakota. Residents there voted 150-148 against retiring the name. Lynn Megal, a 59-year-old stay-at-home mom in Bismarck, said she voted to keep the name. Scott Neumann, a 59-year-old high school orchestra teacher in Bismarck, said the moniker is offensive and voted to dump it. "I'm Irish. I don't have any complaints about the Notre Dame Fighting Irish," Megal said. Said Neumann, "I'm happy to see the opportunity to get rid of it. Native American logos have been abused in too many schools around the country." Robert Kelley, the UND president, said the vote will allow the college to focus on its students. "We are appreciative that voters took the time to listen and to understand the issues and the importance of allowing the university to move forward," Kelley said in a statement. "We also understand how deeply this has affected all of us." 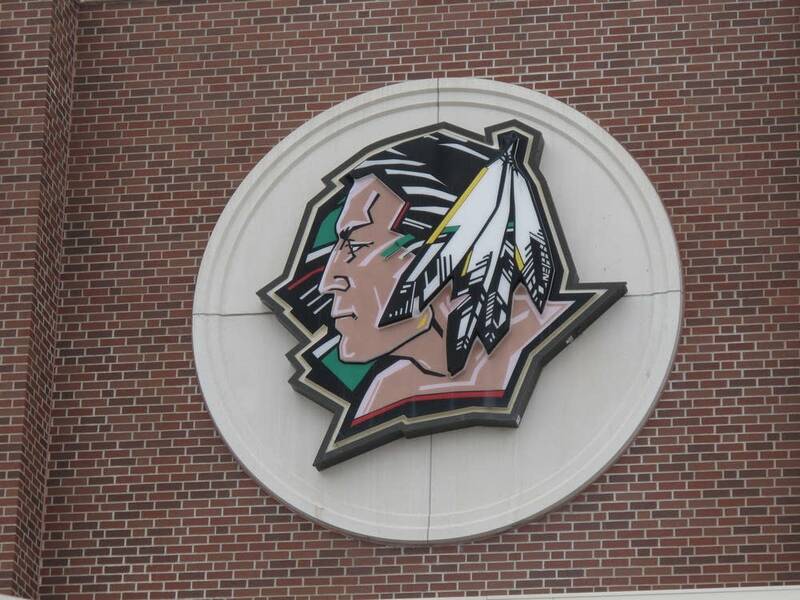 The group that collected petitions for the ballot measure has said it will pursue another vote in the fall to make Fighting Sioux part of the state constitution. Sean Johnson, spokesman for the nickname group, said the results were disappointing but said they plan to continue gathering petitions. "We don't have the option of forfeiting," he said. "There are more things at stake than some unfounded concerns about the athletic program."" Advocates for retiring the nickname say the issue is hurting the athletic department in recruiting and scheduling. Some fear it could affect the school's standing in the Big Sky Conference. Supporters of the name say coaches and administrators are exaggerating the harmful effects, including the conference threat, and don't believe the NCAA sanctions are a big deal. The NCAA banned UND from hosting postseason tournaments and said the school could not use the nickname or logo in postseason play, or else it must forfeit those games. The men's hockey team wore Sioux-logo jerseys in the regular season but switched sweaters in the playoffs. A settlement agreement with the NCAA called for UND to retire the nickname unless it received approval from both the Standing Rock and Spirit Lake Sioux tribes by the end of 2010. Only Spirit Lake passed a resolution supporting the name. Standing Rock has not held a vote. The law forcing the school to use the name and logo was approved in March 2011 but was repealed in a special session after NCAA representatives told state officials that it would not budge on sanctions. Johnson's group then collected the necessary signatures for the ballot measure. Johnson said his group was outspent 25-to-1. O'Keefe said the alumni association spent about $250,000 on the campaign to retire the nickname, all through donations. His group is prepared to launch a similar effort against a possible constitutional amendment, but O'Keefe is calling on the nickname backers to stand down. "All it does is hold the University of North Dakota hostage and create more division," he said.